I'm watching Abbott & Costello Meet Captain Kidd On Demand as I type. [Lou] Costello , Charles Laughton . Yeah, W.C.Fields and A&C aired Thursday Day (11/8/2018). Sometime early this morning they finally updated their ON-DEMAND title list bringing it back up-to-date from "Diane" (which aired late Wed-early Thurs) forward to "Army Surgeon" (which aired this morning, Fri. 11/9/2018). Response time is almost back to "normal" as well. What remains to be corrected is the absence of the "live" East & West feeds, which were the first things to go kaput this week. In the meantime I checked out "Salome" (1922) ON-DEMAND which was on late last night. It is a loose adaptation of the Oscar Wilde play (which itself was a rather loose adaptation of the biblical story). 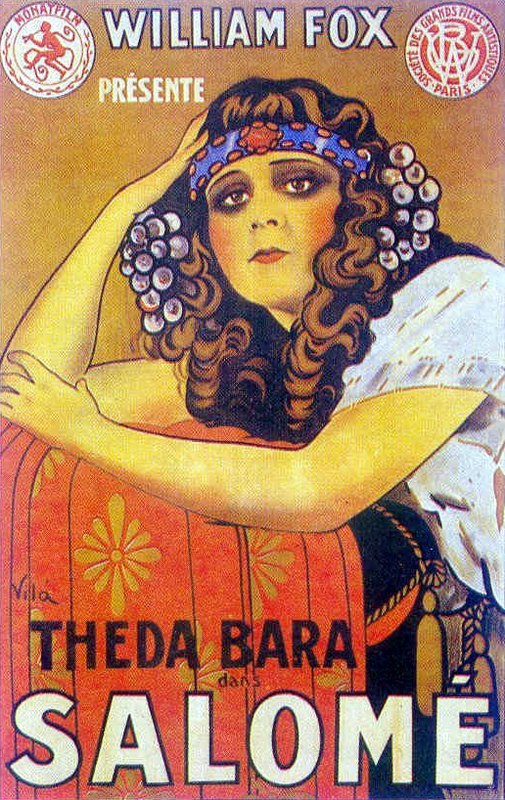 But the one I'm really interested in seeing is the 1918 version with Theda Bara as the "teen" vamp. Theda Bara Clip from Cleopatra (1917) 15 sec. I don't use the "live" stream feature much because if I'm at home I generally just catch the tube when something is airing during the actual broadcast. Still it's garbage that TCM can't consistently keep their act together in all arena's at the same time. I have a question for you CJ, You get TCM from Sling TV right? And you have no other TV Service Provider other than that service, right? And that service itself allows you to stream TCM ON-DEMAND titles? Or does it allow you sign in to WATCH TCM ON-DEMAND using Sling as your TV Service Provider? Just curious, because if you are able to receive all of the same WATCH TCM ON-DEMAND titles with that service, then I see no reason to continue my current TV Service Provider cable subscription just to allow me to continue streaming TCM ON-DEMAND titles. If I can save money by just maintaining my current ISP and not the TVSP and still watch what I generally watch with Sling (primarily TCM plus PBS which I already stream anyway). I know you are asking CigarJoe this one, but here (I hope) is the answer. Thanks... okay, so will I be able to pick up CBS with Sling TV? Or be forced pay seperately just to stream Stephen Colbert? And you have no other TV Service Provider provider other than that service, right? I have Spectrum (was Time Warner) cable provider. I originally had TV-Internet-Phone. I cut the Cable and just got Internet and phone. If I remember the bill used to be about $150-70. Now I just have Internet and phone and Sling TV. I get TCM from Sling TV, and it's the only TV service provider. Yes it allows me to watch TCM live feed or stream On Demand the titles they list usually about 70-80 selections. On the live feed though there are occasional films that are not available, for some reason. For instance, the one time showing of The Glass Menagerie was not available. There is no sign in to WATCH TCM ON-DEMAND, It just part of TCM channel offering. The Hollywood Extra brings you channels like TCM and Reelz for just $5 a month. See below for the basic channel list. My internet service provider is COX and is currently $39/mo, with a one terabyte per month cap (which I have yet to exceed), and ample (for me) 10 mbps download speed (1 mbps upload). My TVSP minimum package that includes TCM is another $69 per month (includes 2 required receivers at $18/mo rent). I use my own DVRs for recording but am now restricted to a single channel recording capability for each receiver (since I must use the providers receivers & tuners). Just thought I'd share another way to cut your cable down to just an ISP. I bought a Straight Talk ZTE Home Phone kit Z723EL ($49.99 from Walmart # 564116719) for my mom. She was able to cut her monthly $48.00 (including all fees and taxes) local calls only home phone bill down to $15 (plus tax) per month and now has a no contract Unlimited long distance (U.S. including Hawaii and Alaska) capability. She keeps her own familiar large key corded phone handset, and you can transfer your own local phone number to the device if you want. It is a no frills (no texting etc.) basic telephone system that is also portable. Her AT&T land line was over 40 yrs old, stat-icky, with intermittent operation and no help or service from ATT. After much frustration I found this to be a suitable replacement. No land line, just an electric plug in, with battery back-up. Hooked her familiar answer machine up to it so she can continue to screen her incoming calls for scammers and to make it an easy transition for her. Now she can talk to her hearts content and the reception has been great for her! i'm thinking about getting a couple for myself as well. A much cheaper replacement for my current cell phone when at home (plus I can take it with me on the road). Only thing less expensive is either a Magic Jack or Skype. Since you are in essense streaming everything to meet your "TV needs" I am curious as to how much data you consume on a monthly basis, i.e. do you use more or less than one terabyte? That I have no idea about. I wouldn't even know how to check. My question is why would it matter? Put it this way, I haven't been restricted in any way so far. The biggest withdrawal problem I had cutting the cord was the loss of live NFL football games on CBS. But it's a good excuse to go to a local sports bar and watch there. Since my team is in the crapper this year it doesn't matter anyway. Just to be clear, it is a monthly calculator. If you have a 1 TB data cap, it estimates you are using less than 1/3 per month. If you snoop around the website for your ISP, somewhere is a place to check your data use. The reason why I asked, was not to personally pry, but to better reassess my own potential needs and expense. I generally keep my regular TV on all the time when I'm at home, for background noise I guess. Whenever I watch (stream a video) on-line it is deliberate and generally specific feature related. Occasionally I do a bit of YouTube surfing and will watch & listen to a string of usually short videos, but as I said, my current data cap with my ISP is 1 terabyte per month, and my current on-line habits have not yet exceeded that cap. However, if I had a service like Sling TV, I am thinking that it would allow me to use (or abuse) it in the same manner as I use my current TV cable subscription, but since I would be streaming everything (some HD and other SD) my thinking is that there is a strong likelihood that I might easily exceed my current data cap, and would have to go to the next or even higher levels with my ISP. There might be a point where I would be paying more for a single internet package than I am currently paying with split TVSP & ISP, which would defeat the cost incentive of "cord cutting". Unless an ISP provides unlimited download data (for video streaming), then it is a concern. i.e. COX has high-speed unlimited internet packages (generally for businesses) that are quite expensive. I assumed that the lions share of your streaming was through Sling. So not knowing if your TV & on-line streaming habits approximated my own, I generally inquired if you used more or less data than I do with my current plan. Does that make sense (or nonsense)? That would be close to a terabyte every 3 days, or just under 10 terabytes per month. One hour of 720p HD PBS streaming generally consumes in the neighborhood of 3.3-3.5 gigabytes. About half that at 360p (which is still acceptable to me on up to a 32" HDTV screen). TCM movie quality from WATCH TCM ON-DEMAND varies (and unlike other streaming services I cannot adjust or control the "definition" quality of TCM streams). Some are apparently in HD and consume 6-7 GB (sometimes more) for a feature length film. While most appear to be in SD (or varying sub levels of SD), i.e. I recently rewatched "Red River" (1948) at 2.16 hr (with intro-outro) and it used 5.16 GB, I just watched "Hell Below" (1933) at 1.41 hr (no intros) and it used 3.79 GB. "The Blot" (1921) (a Thames restoration) at 1.31 hr used 4.96 GB. The 2018 "restored" Kino-Lorber stream of "Salome" (1922) at 1.18 hr (with intro) used 3 GB of data to watch. And I might add that though it was watchable, it was quite evident that the "restorers" did not digitally "clean-up" and make "crisp" the entire print as it still showed many artifacts from aging and poor storage from the original nitrate copies. Point of this is my current monthly on-line data use is less than 1 TB (1,000 GB) and I am averaging less than 33 GB per day (some days more, others less) with most of my usage being from WATCH TCM ON-DEMAND. But when at home I may stream and record one movie via my ISP, while watching a different live-broadcast via my TVSP. So if all of that was combined into my ISP account I may well exceed my current 1 TB monthly cap. With just an ISP for your TV usage, you appear to be consuming close to 10x my current data limit. Using that as a gauge, even if I only turned on the TV while I was sitting in-front of it (as I more responsibly should) I may likely come much closer to your average usage... necessitating an ISP "upgrade". So (based on what I now know) I need to check out my current ISP and see what options are available, and how much they cost. i am thinking that I should perform a closely monitored experiment and try a month of strictly Sling TV to both evaluate it and my data usage of it, while still maintaining my current TVSP & ISP plans. My current TVSP & ISP plans are month-month contracts, if Sling is likewise, then it may well be the way for me to go, so long as it doesn't end up costing me more than what I am currently paying. Anyway, thank you very much for your assistance. I find that it is generally more reliable to gather pro-con information about a product from the consumer perspective as opposed to from that of the seller alone. I am not into streaming so far. Not unhappy with Comcast, except for the annoying X1 box. I follow cord cutting because I like to learn. Many who claim to know what they are talking about, suggest having an antenna as part of cord cutting. I am one who lives too far for broadcast TV reception. TIVO is not the only way to get a DVR for broadcast TV. I would not pay TIVO a monthly fee for TV listings and such. Many say broadcast TV is cleaner than anything else, as it is not compressed. Zero data required. If I were getting too close with my data cap, chances are I'd look into Netflix DVD. It is still alive. The HD antenna would work if you live in an area of relatively flat topography. I'll use my local topography for an example. The Hudson River is at sea level between New York City and Albany, NY, that is 140 miles. The only mountain range between the two cities is the Hudson Highlands, at about river mile 50 to river mile 80 the river is right up against the mountains and makes a few jogs to get through them. If you live in the Hudson Valley from Peekskill South you can pick up HDTV from New York City, from Newburgh North you can pick up HDTV from Albany, as long as you live close to the river. You need a straight shot at the HDTV antenna without any hills or mountains in between. I'm not sure how far the total range is for an HDTV antenna but I'd suspect it would have to do with how high it is.